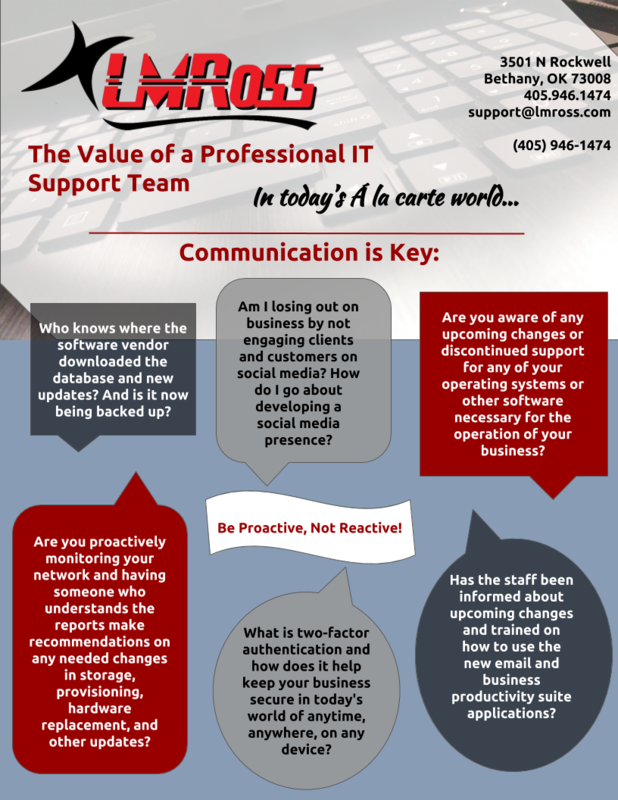 Managed Services and More - LMRoss, Inc. Solutions customized for your company. But what exactly is the LMRoss, Inc. Solution? At LMRoss, we focus on building a business partnership with you, supporting each and every aspect of your technology, and bring years of experience to support your business growth through reliable IT. With a service level contract, you gain more than a ‘service desk’ or a ‘managed solutions’ offering, you get Lawrence Ross as your company’s Chief Information/Technology Officer (CIO or CTO) and his team as your IT department. In short, we are the people you rely on to make sure your business functions with as little technical issues as possible so you can get on with doing what you do to make money. We are in it with you for the long haul. Each business we work with has their own individual needs and challenges that require special attention and cannot be treated in a cookie cutter assembly line fashion. Today’s IT department isn’t just about managing networks and people, it’s about navigating through the myriad of choices using our experience to help you meet your goals.